Though the ocean flourishes with a multitude of life forms today, an even broader diversity of plants and animals was present millions of years ago and is now preserved for us in fossilized form. Trilobites are an extinct arthropod that lived 521 million years ago. A hardy and adaptable species, trilobites managed to survive for over 300 million years. They were so prolific that over 20,000 trilobite species have been documented and they have been found on every continent. The trilobite’s name is literally a description of its body, which is divided into three lengthwise and parallel sections, or lobes. Like all arthropods, it had a segmented body, jointed legs and an exoskeleton; the trilobite’s distant cousins are scorpions, spiders and lobsters. They ranged in size from as large as a dinner plate to as small as a pea, and every size in between. Some walked along the sandy bottom, while others were able to swim. Fulfilling many areas of the ecosystem, trilobites were plankton eaters, scavengers or predators. One fossil tells a story of long ago, showing a preserved worm trail and a fossilized track of a trilobite. The two distinct trails are heading toward each other, yet after they intersect, only one continues on: the track of a presumably full trilobite. Trilobites are generally believed to have had the first complex eyes. Some species even had compound eyes, like a fly. These eyes had multiple hexagonal lenses of calcite and were therefore able to be preserved when fossilized. Other species lived in the deep sea, below the reach of light. These species had no eyes. Still others had eyes on the top of thin stalks; they could bury themselves in the mud and still use their mini-periscopes above ground. Some trilobite species could roll up into a ball when scared – some were even fossilized in this defensive posture. Occasionally, a trilobite fossil is found with a bite taken out of it. Oddly, most of the bites are from the right side, thereby indicating either a predator’s attack preference or the trilobite’s distinctive evasive maneuver. Trilobites’ artistic symmetry and unique abilities make them a must for any fossil collection. Come into Earth’s Treasures and hold one of these amazing enrolled trilobites in your hand. 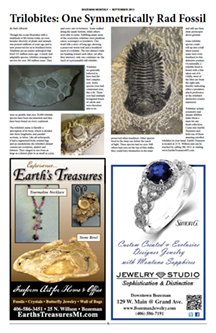 Earth’s Treasures is located at 25 N. Willson and can be reached by calling 406-586-3451 or visiting www.EarthsTreasuresMT.com. Our store is full of great gifts! But if you’d rather let someone choose their own treasure, we offer gift certificates, too. We can ship anywhere in the U.S.—even large items can be crated for shipping.